Eight years ago, Lori Dente gave birth to a little girl named Sofia Isabella Dente. Before her birth, Sofia — also called Sofie — had compressed her umbilical cord. She was born with a severe brain injury, leaving her in a vegetative state. Three weeks later, on Valentine’s Day, Sofie passed away. 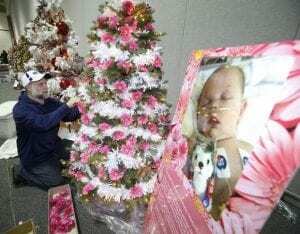 The little girl’s memory has been honored for the last eight years with a Christmas tree at the annual Akron Children’s Hospital Holiday Tree Festival decorated by her father, Michael, with the help of her mom and three younger brothers, Alex, 6, Max, 4, and Leo, 2. Though Michael Dente is not the main tree decorator at the family’s Wadsworth home, he has taken the lead at the festival. “This is how I celebrate Christmas with my daughter,” he said. This year’s tree, named “The Sofia” is decorated with bright pink gerbera daisies and white garland. It follows last year’s tree, which was decorated with colorful butterflies, and is similar to one he decorated several years ago representing the bright flowers used at Sofie’s funeral. It will be one of the first trees that visitors will see as they walk into the 37th annual festival at the John S. Knight Center in downtown Akron. The event is free and is the hospital’s gift to the community, organizers said. It runs from Saturday, Nov. 17, to Sunday, Nov. 25. A preview gala on Friday is sold out with more than 900 guests expected. Two Breakfasts With Santa Saturday are also sold out. Originally founded in 1982, the 2018 festival will feature more than 85,000 strings of lights, 150 decorated trees, more than 85 wreaths and hundreds of other holiday decorations. All items on display are donated by local corporations, groups and individuals and will be available for immediate sale to benefit the hospital. To date, the event has raised more than $5.7 million to benefit the continued efforts of medical research, education and patient care programs at Children’s. 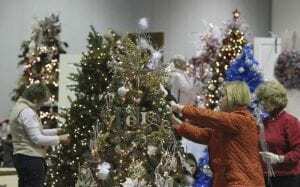 “For 37 years, the Holiday Tree Festival has been a holiday tradition for families in Akron and the surrounding communities,” said Mary Leuca, festival chairperson. Last year, the festival raised $326,000, up from the $240,000 raised the year before. 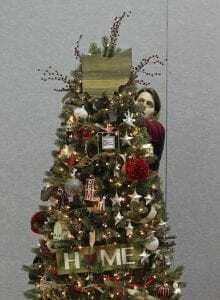 That’s because one tree that was donated by retired dentist Dr. James Fanno and designed by longtime decorator Lori Reilly of Reilly’s Originals sold during a silent auction for $30,500 to an anonymous donor. Most trees are priced for purchase between $250 and $3,000, but the tree included most of Fanno’s private collection of Christopher Radko ornaments, which can sell for $40 to $200 each, said Reilly. 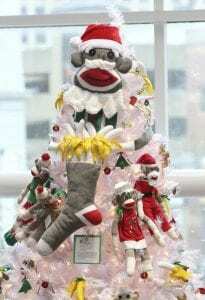 She used 300 ornaments to decorate the tree and a tabletop tree that sold for $500. 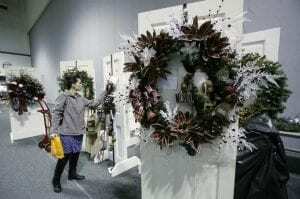 Another tree at this year’s festival is “Home for the Holidays,” and features all things Ohio, said decorator Erin Duff of E. Duff Designs, a commercial interior designer in Medina. Duff said she used Ohio-related decorations including carnations, cardinals, ladybugs, white-tail deer, planes, lighthouses and several signs that have Ohio. Duff, who is in her 10th year decorating a tree, said she is dedicating this year’s tree to her mother, who is ill and is likely celebrating her last Christmas. “She loved the festival. I’ve come here since I was a kid,” Duff said. 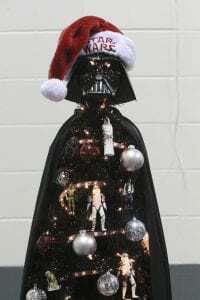 Her husband, Clifford, has also decorated a few trees and this year decorated a nearby “Wi-fi Tree,” which has lights that can be changed and controlled by phone.